It was only 13 years later my grandma, or Ah Ma as how my family members would call her in the Fujian dialect, would reapply for another citizenship certificate based on a date her mother assumed was her birth date. Ah Ma is hence ‘officially’ born in 1927, which makes her 84 year old this year, four years younger than Singapore’s founding father Lee Kuan Yew. Back in 1927, Singapore was growing rapidly as a trading port under the British crown colony and immigrants poured in from all over Asia to seek for better living prospects in this foreign land. 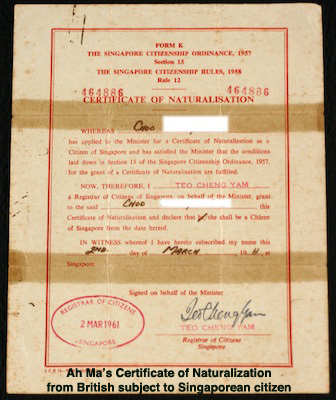 Like majority of Singaporean Chinese, my ancestors came down from the Fujian province but Ah Ma has never regarded herself as an immigrant. Born and bred as a second-generation Singaporean, she has no clue about her parents’ hometown. Because Fujian is a huge province, my online search for any possible prefecture, district or village named jio po was a futile effort, made more difficult by a lack of Chinese translation for its name. Yet it is this sense of rootlessness to their home country that fostered a unique local identity during the colonial era. Ah Ma remembered Singapore under the British rule as a ‘very free’ period with little rules and regulations but a relatively safe living environment. 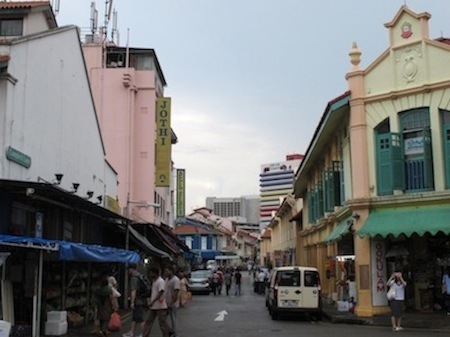 For the first 20 years of her life, she lived at Kam Kong Ka La Bu, an older reference to the area around modern day Tekka market in Little India. I was curious to take a closer look at Ah Ma’s Kam Kong Ka La Bu and decided to head there under her vague and scant description. Fast forward 70 years, yesterday’s hawkers who ply the streets are now comfortably sitting in shops. The street performance Ah Ma used to watch is no longer there. Names of streets have also changed. As such, it took me a couple of detours and phone calls before grandma made an intellectual guess that she lived on either Campbell Lane or Dunlop Street. In this ever-changing city, I think if Ah Ma were to go back to her Kam Kong Ka La Bu, she would probably be unable to recognize the building that used to be childhood home. More to come in the next part of this series – Introduction to Ah Ma’s family members and everyday life back in the 1930s. Do leave your comments below about your thoughts and recommendations about this new “My grandma’s stories” series! This is amazing. im doing a research so do u think i u could post abt ur grandma’s hobbies? Hope to get a reply frm u soon. interesting post, thanks for the effort! I love this post! I missed the opportunity to ask my own grandma these questions, and this post helps me understand my own ancestry and Singapore’s history better! Ah, I remember my grandmama also.. she passed away six years ago. She also used to tell us (me and my cousins) stories about her life and the war. It mostly consists of hiding from the invaders though. I like this mini-series, it reminds me of my grandparents. This is great! I love to hear the stories of my elders. I took a job in high school just so I could be near my great-grandmother and come by after school nearly every day to listen to her stories. I think this is a great idea and I’m looking forward to hearing more of your grandmother’s stories. I’m glad to hear that you enjoy reading this series and it’s a great encouragement for me too (: Will certainly be posting more next time, so do keep coming back for more!